You are buying a Case of 5 Boxes of Pen Needles NovoTwist 32G 5mm, each box contains 100 pen needles - a total of 500. 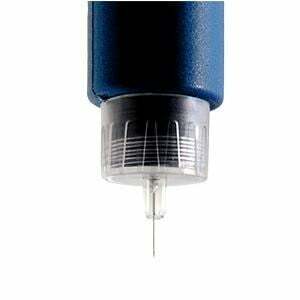 Novo Nordisk is a leading manufacturer of Pen Needles and diabetes supplies. At ADW Diabetes, we offer the complete product line of diabetes pen needles. Most people that have tried NovoTwist® prefer NovoTwist to the conventional thread needle Novofine. In two recent surveys from Novo Nordisk of people living with diabetes were asked to test NovoTwist. Most people preferred the - just twist - attachment of NovoTwist compared with the - turn, turn, turn - attachment of the conventional thread needle Novofine . Novo Nordisk is committed to providing products to address real patient concerns – NovoTwist was developed in response to physician, nurse and patient feedback. Proper attachement of needle with the help of a confirmatory click. NovoTwist has a unique bayonet fitting that allows for a firm and reliable attachment to Next Generation FlexPen. The extra-thin wall (ETW) technology used with NovoTwist is designed to reduce the effort required to inject. The NovoTwist Integrated glue tower is designed to reduce the risk of needle breakage. NovoTwist needles have been shown to be suitable for delivery of insulin into the subcutanous fat layer of the skin. NovoTwist needles have a 32G Tip or 30G, which are designed to cause you less pain during injection. Studies have shown that diabetic people feel less pain with thinner needles.